This is a continuation of?เล่นคาสิโนออนไลน์ให้ได้เงินFrom Social Movements to ‘Other’ Societies in Movement – Part 1. Fourth, we note the affirmation of lowland Black and Indigenous peoples as front-line actors, but doing it their own way and in a manner that differs from that of the popular sectors. Black protagonism is visible above all in Colombia and Brazil. In both cases, organizations of African descent have been around for decades, but in the last decade they have come to the fore of resistance struggles. The Process of Black Communities (PCN, its initials in Spanish) is a network of 120 ethnic-territorial organizations – community councils and grassroots organizations – with a strong presence on the Colombian Pacific coast since the 1990s. Their struggle is for territory as a cultural right and collective title of the land. The PCN is organized in regional palenques and its maximum authority is the Assembly, followed by the National Council of Palenques. One of the regional Black organizations is Cococauca (Coordination of Councils Communities and Grassroots Organizations of Black People of the Pacific Coast of Cauca), which is composed of nine community councils and four base organizations. The councils are a “power of their own,” a local power or an ethnic authority, product of a long ethnic-territorial organizational process, which has enabled them to obtain collective title of their territory and exercise authority over it based on their own cosmology and culture. In this sense, the educator Ricardo Monta?o says that “today the Black is no longer a peasant but a Black with territory” (conversation with Ricardo Monta?o, 11/15/2016). Colombia’s Black communities suffered in a very particular way during the country’s armed conflict; Afro-Colombians comprised one-third of the almost 7 million displaced. They also suffered as a result of mining extractivism. In 2008, 10,000 sugar cane cutters in Sinalcorteros went on strike against labor conditions and demanded better payment for cane cut to piece, occupying eight mills in the Valle del Cauca. Cutters earned little more than the minimum wage, while paying for social security, tools, work clothes, and transport to the cane fields out of their own pockets. Work accidents incapacitate some 200 cutters each year. While the Afro-Colombians fought in the mills, the Minga of the Peoples re-vitalized the Indigenous mandate of 2004 that rejected the United States-led Free Trade Area of the Americas deal (FTAA) and other measures of the álvaro Uribe government. About 10,000 Indigenous organized the Minga (communal work), especially groups organized in the CRIC (Regional Indigenous Council of Cauca) and the ACIN (Association of Community Councils of the Northern Cauca). As they marched to Cali and later to Bogota, they were joined by the striking cane cutters, an unprecedented act in the history of both peoples. “We all are cane cutters, we are all Indigenous,” read an ACIN statement. 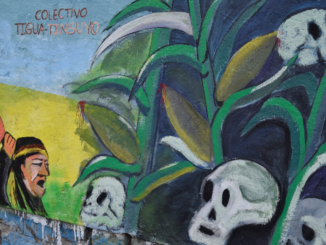 The Black mobilization in Colombia has been prominent since 2008 and particularly since its integration in the Agrarian Summit that emerged from the 2013 strike, when an alliance was forged between peasants, Indigenous, Afro-Colombians, teachers, students, coffee producers, truckers, and more. In 2016 another agrarian strike in the framework of the peace negotiations with the FARC guerrilla showcased the strength of Black activism through actions such as the blockade of the Pacific port of Buenaventura to prevent shipping trade, an action as symbolic as it was bold. In Brazil, a new Black movement began to form in the mid-2000s that was more youthful and female, more autonomous and combative. First were Maes de Maio (Mothers of May), the response of women from the periphery of S?o Paulo to the murder of 500 poor youth between May 12-20,2006, by the Military Police in revenge for the attacks of the First Commando of the Capital (PCC) cartel on police stations and police vehicles. The Mothers of May brings together women from several states and remains a small but active organization of denunciation and support for the victims of repression together with NGOs and groups working among the poor Black favela youth. Since 2003, when Lula took government, the violent death of Blacks grew by almost 40 percent, while the violent death of whites fell 25 percent. Dozens of groups have been born in the urban favelas and peripheries of Brazil, particularly the powerful June 2013 movement, representing a new generation of militants, many of them trained in secondary schools and universities, with young women playing a leading role. One of the most significant is Ocupa Alem?o from the Maré favela complex of Rio de Janeiro. They reject the paternalistic way the left relates to the favelas, and don’t spare NGOs of criticism. They carry out cultural, recreational and economic activities, and raise Black consciousness about the history of cultural and political resistance. They see themselves as heirs of the quilombo and the palenque rebellions, which they consider examples of political and economic autonomy. The “Reaja ou Seja Morta, Reaja ou Seja Morto” – “React or Die, React or Die” – campaign was born in Bahia in 2005 and every year organizes the March Against the Genocide of Black People. It is probably the most important creation of the Black movement due to its strong sense of autonomy, its radicalism, and refusal to be coopted by the state. It links with other groups throughout the country and with Black women’s movements. It has grown in recent years partly due to the campaign’s own initiative, but also because it has benefitted from the social policies of inclusion of the Workers’ Party (PT) government. 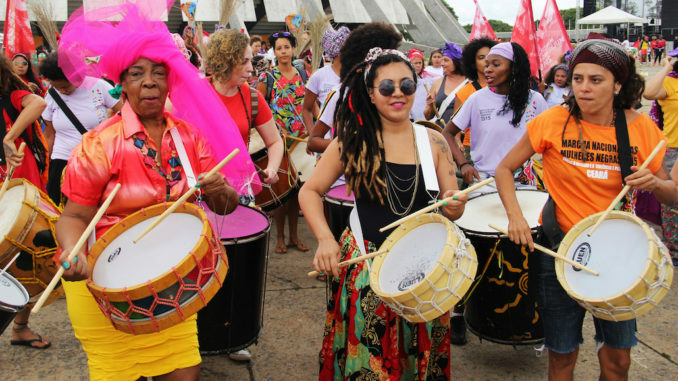 Brazilian Black people’s struggle is represented in many organizations: from the Mothers of May to the Movement of Homeless Workers (MTST), from the collectives born in the favelas to the most diverse groups of Black women. Organized peoples create their own powers, their own justice, and above all, their own forms of defense or self-defense. The lowlands Indigenous movement demonstrated its power in the Baguá uprising in the Peruvian Amazon jungle (2009) and in the march in defense of TIPNIS in Bolivia (2011). These are two acts of resistance against the advance of extractivism at a local level that have had major repercussions nationally and internationally. Solidarity for the demands of the Indigenous came from urban sectors and a sizeable part of the population, ensuring that the campaigns remained central in the national political agenda for a long time. 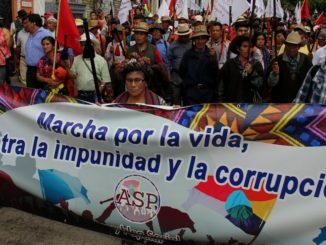 Eight years after the armed confrontation between Wampis and police in Baguá, Peru, that left hundreds dead and disappeared between Indigenous people and police, 300 representatives from 85 Wampis communities formed an autonomous self-government as a means to defend 1.3 million hectares of forests from the extractivist multinationals. They elected the first president of the autonomous territorial government and 80 parliamentary members. Months earlier, 120 representatives of communities close to the Morona and Santiago rivers approved the Autonomous Statute of Territorial Government of the Wampis Nation, designated a commission for the constitution of the government and presented a project of the biological corridor in their territory. As Quechua leader Hugo Blanco noted at that time, we are witnessing a change in the way the Peruvian social movements act, but for the Wampis, the formation of a self-government seems more akin to the corollary of a long road started in the 1970s. Other lowland peoples are playing an important role in the resistance to the extractive model in its various forms. The struggle against the mega-dam at Belo Monte is one of the most important struggles in Brazil. Resistance began four decades ago when construction of the dam began. 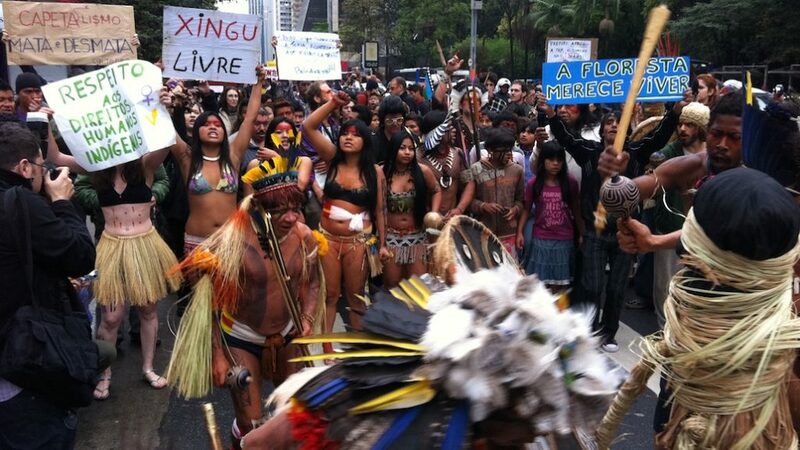 The struggle mobilized Indigenous peoples, the inhabitants of the banks of the Rio Xingu, and social movements, instigating one of the most radical critiques of developmentalism. For the Brazilian Worker’s Party (PT) governments, Belo Monte represents probably their worst legacy, both in terms of the environmental impact and in relation to the insult and injury caused to the Indigenous communities that were never even consulted by the authorities. One of the most interesting cases is that of the lowland peoples of Bolivia, who “have become the most permanent nucleus of resistance to the expansion of an extractive and predatory capitalism in the country” (Tapia, 2013: 103). More than 30 peoples and cultures began to unify during the 1980s into regional inter-ethnic assemblies and later joined with the Confederation of Indigenous Peoples of Bolivia (CIDOB, in its Spanish initials), created in 1982. They began with the reconstitution of their territories conceived as productive spaces in the processes of production and social reproduction. Further, these are spaces of self-government for each culture, creating a constituent assembly demanding not only legal equality in the state but “equality between different peoples and cultures” (Tapia, 2013: 96). Lowland peoples have made it possible to think of a pluri-cultural horizon in Bolivia. As a “consistent plural minority” (Tapia, 2013) – because they represent both diversity and pluralism – they played a decisive role in the March in Defense of TIPNIS between August and October 2011, which was the largest national mobilization in defense of Indigenous territories in Bolivia, and became a national benchmark for articulation of democratic forces. In several countries, lowland peoples have demonstrated their capacity to become centers of resistance to capitalist expansion and to unify with other movements to take the struggle onto a national level. In Tapia’s words, they have become “the core of moral resistance and it could also be said, the nucleus of the intellectual direction, in the sense that they embody the idea and the political project for the defense of Indigenous peoples territories, their sovereignty and their forms of self-government” (Tapia, 2013: 105). Fifth, organized peoples create their own powers, their own justice, and above all, their own forms of defense or self-defense. There are many examples of collective self-defense experiences, both rural and urban, throughout the continent. At times this form of defense has become common sense for peoples and movements. Among the most prominent are the EZLN, the Nasa-misak Indigenous Guard of the Colombian Cauca, the Community Police of Guerrero, and the peasant patrols of Peru. They have all been developing for decades and have shown a capacity for defending themselves, without going to the state or allowing state interference in their territories. In general, these are forms of self-defense and of power created initially by Indigenous communities but adopted by peasants and urban sectors. Not limited to defending from outside aggression, they also impart justice and oversee order within the territory. Furthermore, self-defense is an educational process that strengthens communities and the structures and material bases of those who resist. In many cases they defend communities from mining, such as the Cajamarca peasant patrols to protect river sources from pollution caused by multinationals. The process of the Community Police of Guerrero merit some reflections. The Regional Coordinator of Community Authorities-Community Police (CRAC-PC) was born in 1995 to defend against criminality. It initially comprised of 28 communities that managed to reduce crime rates by 90 to 95 percent (Fini, 2016). At first they were delivering criminals to the Public Prosecutor’s Office, but seeing that they were released in hours, a regional assembly decided in 1998 to create the Houses of Justice where the defendant could be heard in their own language, without paying lawyers or fines. Community justice seeks the “re-education” of the convicted person and with the trial it seeks to reach agreement and conciliate parties, involving both families and community authorities. The “re-education” of the culprit consists in working to serve the community because this justice has no punitive character, instead seeking to transform the individual under supervision from the communities. The highest authority of the Community Police is the open assembly of the localities belonging to the CRAC-PC, by agreement of the local community assemblies. The assemblies “appoint coordinators and commanders, as well as remove them from office if they are not fulfilling their duty; in addition, decisions are made regarding the delivery of justice in difficult and delicate cases, or with important matters that affect the organization” (Fini, 2016). Unlike the state police, the CRAC-PC has never had a vertical or centralized command structure. Power as exercised by the communal authorities is understood differently; this is what we mean when we talk of non-state powers. Community Policing expanded significantly in both the state of Guerrero and the whole of the country as state violence and drug trafficking intensified against the people alongside the delegitimation of the state apparatus. By 2013, self-defense groups were present in 46 of the 81 municipalities of Guerrero, involving some 20,000 armed citizens (Chavez, 2015). ? The differences between community police and self-defense groups should be noted. Self-defense are groups of citizens who are armed to defend themselves against delinquency, but unlike the Community Police, militia members are not appointed by their communities. Furthermore, unlike Community Police self-defense groups are not accountable for their actions, regulated, or held to a community code (Hernández, 2014). However, the expansion of self-defense groups is due to the growth of armed Indigenous defense promoted by the 1994 Zapatista uprising and recognized by the 2009 Ostula Manifesto, approved by Indigenous peoples and communities from nine Mexican states attending the 25th National Indigenous Congress (CNI), asserting the right to Indigenous self-defense. When these levels of massiveness are reached, it is no longer possible to speak of self-defense groups of a particular social sector but of society as a whole. Exponential expansion occurred not only in the state of Guerrero, but also on a national scale where “an eruption of self-defense groups was registered in more than a third of the country” (Hernández, 2014: 7). When such levels occur, it is evident that the phenomenon is reproduced without following the original guidelines: newer groups may not have a similar level of community control as the CRAC-PC, and may implement different forms of justice and penalties. The expansion of the self-defense groups indicates something deeper: society is taking the defense of life and territory into their own hands, and following a peasant/Indigenous model, supported in the culture of the community in order to build autonomy. What is being defended is the “other world” that exists in rural and urban territories. They are defending the forms of life they have chosen collectively, and that is why we say that not only are they self-defense groups of Indigenous people or other sectors, but the “other society” in movement. In the cities we have fewer experiences of self-defense, but there are examples, like in some “misery belt” districts of Buenos Aires or the housing communities of the Francisco Villa Popular Independent Organization in Mexico City, among others. In the town of Retiro (villa 31 bis), the Corriente Villera Independiente and the Popular Movement La Dignidad created the House of Fighting Women, a space of formation, debate, collective organization for survival, and defense against macho violence. The women’s self-defense groups carry out training workshops which are “a tool of organization, regrouping and direct action that can address certain situations, as well as accompanying and counseling women” (Mujeres en Lucha, 2014: 117). The self-defense groups detect cases of sexist violence and intervene in solidarity with the victims and if the woman demands, expel the aggressor. During this stage of history, capitalism assumes colonial characteristics to wage war against the people and is based in patriarchy as the simplest way of disciplining women and young people. Societies in movement are those that confront this system of death. In the community of Acapatzingo, Mexico City, vigilance commissions overseen by brigades of citizens are responsible for the security of 500 families. They provide neighborhood watches and ensure that armed people do not enter, not even police. In addition, local complaints and problems are brought to the commissions, which can take cases to the community assembly for resolution if necessary. The sixth characteristic is that the movements assume a strong anti-colonial attitude. The perception of this characteristic is relatively new and is related to the re-colonization implicit in extractivism and the important presence of Indigenous peoples in the movements who have suffered five centuries of colonial exploitation. Mining is the most brutal expression of extractivism and a tragic “return to the origins” of colonialism (Machado, 2014). The present model implies the vertical and authoritarian occupation of territories that requires militarization to expel communities in order to reconstruct them to the benefit of capital. In this model of accumulation by plunder, the people who live there are a problem to be rid of. The occupation of territories is followed by the establishment of asymmetric relations between the multinationals and the nation-states that are re-colonized. Completing the colonial model, extractivism generates enclave economies, which are vertical and removed from the local economies. Nevertheless, there are substantial differences between this extractivism and the original accumulation, which David Harvey describes as a process of “accumulation by dispossession.” In the European experience, wage labor arises from the violent expropriation by the producers causing a split between production and means of production, a process which gives rise to “free proletarians” (Marx), who will be employed by the nascent industry. From this process of expropriation comes the capital-labor relationship. But in Latin America, expropriation assumes other forms. The Indians were forced into unpaid work in the mines, and the Blacks were forcefully wrenched out of their continent and enslaved. The “free laborer” of Europe is nowhere to be found. In the new colonialism of multinational mining and agribusiness, those expropriated are the descendants of the same Blacks, Indians and mestizos who have been dominated by colony. Of the 150,000 killed (dead and disappeared) in Mexico’s drug war, the vast majority are women, Indigenous and poor. As happened with the conquest, we are faced with a capitalism without proletarians, a genocidal system that demands subordination and only recognizes the white upper-middle classes. Under this model, neo-colonialism is faced by the same actors who resisted the conquest: the poor of the city and the countryside. That is why struggles against extractivism are insurgencies that become anti-colonial resistances. The fight against extractivism is at once an anti-colonial struggle, for the defense of the territories, for sovereignty and for self-government of communities. Neo-colonial extractivism is a war against the people and cannot advance unless it establishes a permanent state of ?exception that turns nation-states into police states (Zibechi, 2014). Finally, it seems necessary to understand that the struggles weave the different strands of resistance together: anti-capitalist, anti-colonial, and anti-patriarchal. During this stage of history, capitalism assumes colonial characteristics to wage war against the people and is based in patriarchy as the simplest way of disciplining women and young people. Societies in movement are those that confront this system of death. But these “other” societies do not do so as segmented social movements (as workers, women, Blacks, Indians, and so on), but as societies based on heterogeneous social relations that are set in motion; they move/shift away from the previous place in order to survive and reproduce life. Raúl?Zibechi?is a Uruguayan writer?and?one of the best known political analysts in South America.? Tzul Tzul, Gladys (2015) “Sistemas de gobierno comunal indígena: la organización de la reproducción de la vida”, El Apantle, SOCEE, Puebla, octubre, pp. 125-140. Velázquez, Jurhamuti y Lepe, Luz María (2013) “Parankuecha, Diálogos y Aprendizajes: Las Fogatas de Cherán como Praxis Educativa Comunitaria”, International Journal of Multicultural Education, Vol. 15, N° 3, Eastern University, Pennsylvania, pp. 61-75. Tapia, Luis (2013) “Los pueblos de tierras bajas como minoría plural consistente”, Contrapunto N° 2, Universidad de la República, Montevideo, pp. 95-111. Fini, Daniele (2016) “La Comunitaria. El Sistema de Seguridad y Justicia Comunitaria de la CRAC-PC en Guerrero”, México, inédito. Chávez, Lourdes (2015) “Se crean en dos a?os cuatro sistemas de seguridad y justicia ciudadanos y cinco policías comunitarias”, en El Sur de Acapulco, 15 de abril. Mujeres en Lucha-Movimiento Popular La Dignidad (2014) “Mujeres villeras tejiendo seguridad en la prefiguración del espacio urbano”, Contrapunto N° 4, Universidad de la República, Montevideo, pp. 107-119. Machado Aráoz, Horacio (2014) Potosí, el origen. Genealogía de la minería contemporánea, Mardulce, Buenos Aires. Hernández Navarro, Luis ? (2014) Hermanos en armas – Para Leer en Libertad A.C.